Being reputed as the 'Glass Hub of Southeast Asia', Glasstech Asia 2018 is an unparalleled glass exhibition providing regional industry players deeper insights to the glass manufacturing, processing, products and materials sectors. Held in conjunction with the 3rd edition of Fenestration Asia 2018, it will showcase industry standards in sustainability, automation and energy-efficiency to satisfy the increasing global demand for windows, doors and facades. A line-up of exciting glass conferences will also be available for this year’s edition including ASEAN Glass Associations Summit (AGAS), ASEAN Architectural Glass Conference (AAGC) and “The Green Building Seminar” with Malaysia Green Building Confederation. Glasstech Asia 2018 will provide an excellent platform for industry players across the globe to step foot and tap into the growing market of South-east Asia! 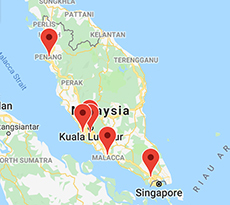 Glasstech Asia 2018 will be staged in Kuala Lumpur, Malaysia, from 14 - 16 November 2018.